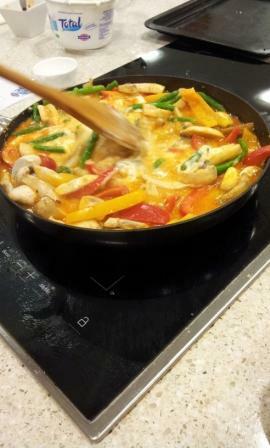 This is my version of a delicious Thai style curry devised by Martin Macdonald from Mac Nutrition. The photo above shows the version we made at Cheshire Cookery school. We like a fruity style curry, so for tea tonight I’ve made a few changes. I simply fried some chicken strips in coconut oil, added some thai curry paste, fresh peppers, beans and mushrooms. Added some cubes of fresh pineapple and used a tin of coconut milk to make a thick sauce. Served up with whole grain rice and a large salad, the whole family enjoyed it. Quick, uncomplicated, healthy food – just we needed after a hard week of work and socialising! That looks very tasty! I’ve recently been using the jars of Patak’s curry pastes – they cover the full range of Indian curries and have a good flavour ……. you can add meat and fresh veggies to taste.